1 cup Salted Jellyfish shreds, rinsed of salt and briefly blanched. 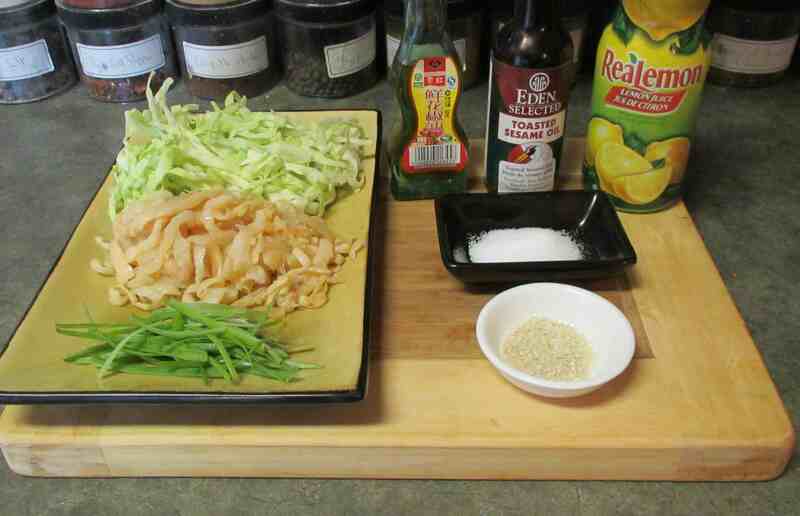 First, put the cabbage and scallion into a bowl and sprinkle the salt over, mixing everything well. 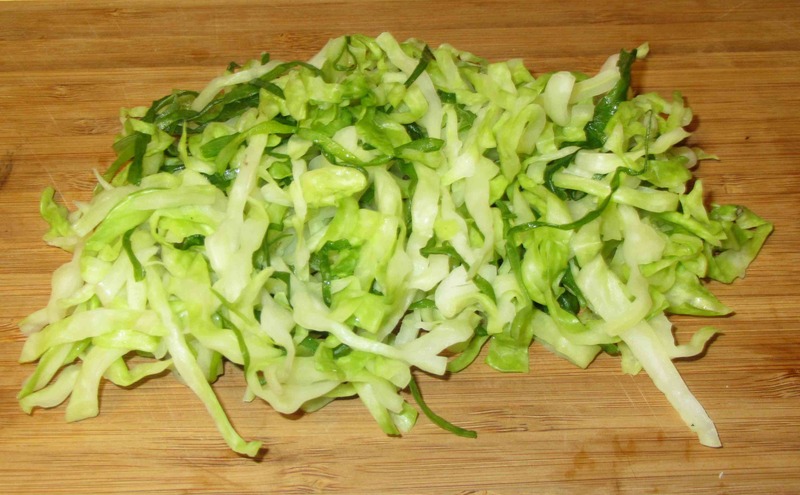 Let this sit for about 30 -45 minutes until the cabbage is nicely wilted and then rinse off all the salt. Squeeze well to remove the excess water. 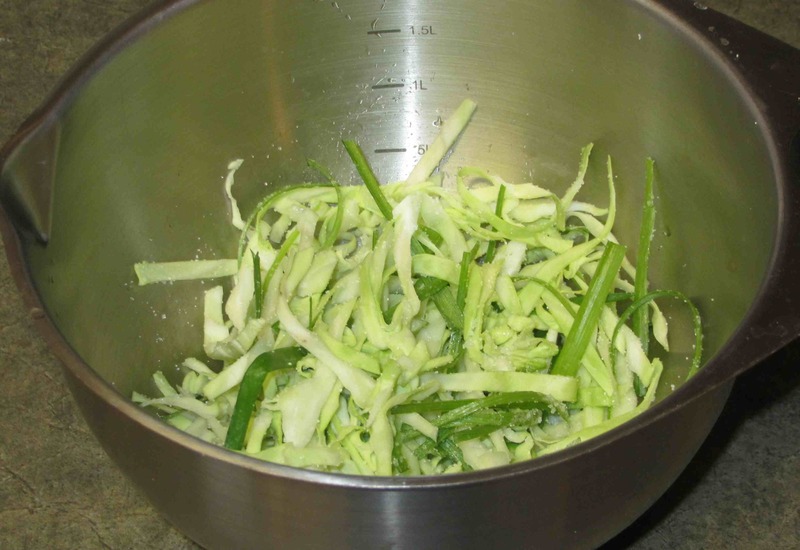 Put the cabbage and scallion back into the bowl along with the Jellyfish shreds and toss with the lemon juice and both oils. Plate, after letting any excess oil drain away, and garnish with the sesame seeds. 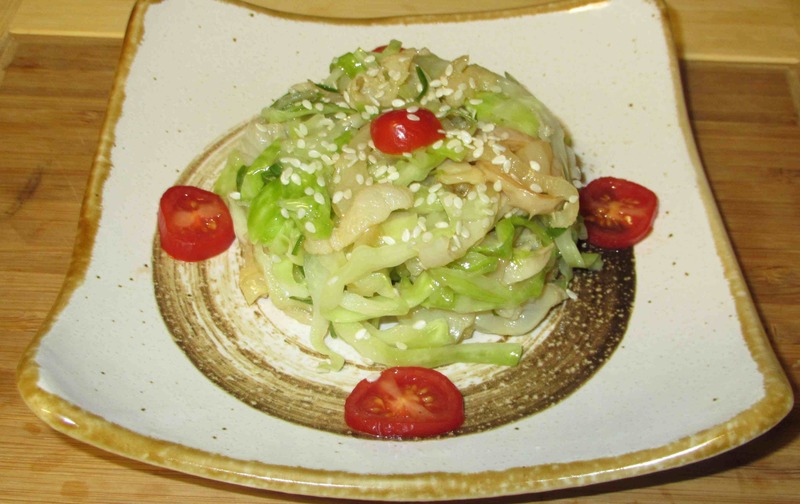 That is a great jellyfish salad. I wondered how it will look with toasted black sesame seeds (when toasting black sesame seeds remember to put a few white ones in to make it easier to know when the black one are toasted). Oh… that’s a good tip! Wow… never thought i would even consider jellyfish…. Any recommendations on where to purchase it? Not sure if my local grocery stores carry this…. If you live in a large city, especially one with a Chinatown, you can usually find them in Chinese grocery shops. I can’t get them locally, I always pick them up when I am down south in Ottawa. I’ve never eaten jellyfish, but I’ve sampled calamari, which I guess is somewhat related. What’s the texture of jellyfish like? Is it chewy, like calamari? Not quite as chewy as calamari … I like the texture very much. I would love to try jellyfish – never had that before – only ever seen them washed up on the beaches here in South Africa. I didn’t even know you could eat them. I adore jellyfish! As I was reading, I was thinking that it’s usually just sesame oil and chili oil. Maybe a splash of vinegar. Sichuan pepper oil sounds like a terrific thing to have in the pantry though. I will keep an eye out for it! You can make Sichuan pepper oil quite easily … I keep meaning to do a post on it. That sounds pretty awesome to make! I love chili oil. Maybe too much because I really slosh it on! But how can you go wrong with liquid fat and spice? !